I just got a pile of new notes to start with after about two weeks break. I have less than one week time. I’m excited. I also have few mouthpieces for testing. It’s going to be a good start after loading my batteries traveling. I think sometimes musicians believe that they are not allowed to have any holidays or free days from playing. I’ve met people who might say that the Christmas Eve is the only night of the year that they don’t play. But as in any profession, I believe that people need holidays. We need time to get away from our job. Our body and mind demands it. You can for sure remember times when you are totally tired but you just need to do these few more things and practice few more hours. But still you are not making any progress. I’ve been lucky to have teachers who see my struggling and advice me to relax for couple of days. Sleep over it and everything feels better. When I was a kid I never played during the summer holidays. Probably also any other holidays I skipped playing. During my studies I of course realized the fact that you must practice. The beginning after two weeks brake is… not always pleasant but I’ve learned to deal with it. For my thesis I was reading and writing about smart practicing. Use the brain more not to harm your body. If you keep repeating same mistakes you will learn them but if you would stop and think really what you are doing wrong and correct it after thinking, you would also save a lot of time. I found out that for one day brain can focus fully for 4 hours. Only 4 hours! Of course it might be individually as everything. Other time the brain needs to relax and restore the new learned stuff. Rest of the day you can for example do sports while letting your brain automatically repeat all the played music. Also sportsmen have totally free days from doing sports so their body have enough time to recover. Also musician’s body needs to recover because the playing is static physical activity. So actually you shouldn’t play at least for one day per week. If you are athletic musician you might have to give a free day same time both from playing and sports. My friend got in a state of over-training since they didn’t give a thought about how demanding the playing can be with her personal trainer. Anyway you might feel that you lose time if you don’t practice but the result might be the same if you practice when tired or not at all. Or I believe you will feel better after resting than after practicing in a bad mode. The risk of getting sick and hurting yourself is higher too, which can lead you to skip anyway the important performance. During Christmas holidays 2013 I stayed alone and came up with a routine of going outside walking after breakfast, writing my thesis until lunch time and then practicing between lunch and dinner and maybe writing a bit more in the evening. I was extremely “busy” and had to be careful to give me every fourth day just a brake day of it all. I was training for audition in Oslo. There was many things to do but all in all the practicing season was really good and I enjoyed it. Only thing I was missing was the sun. 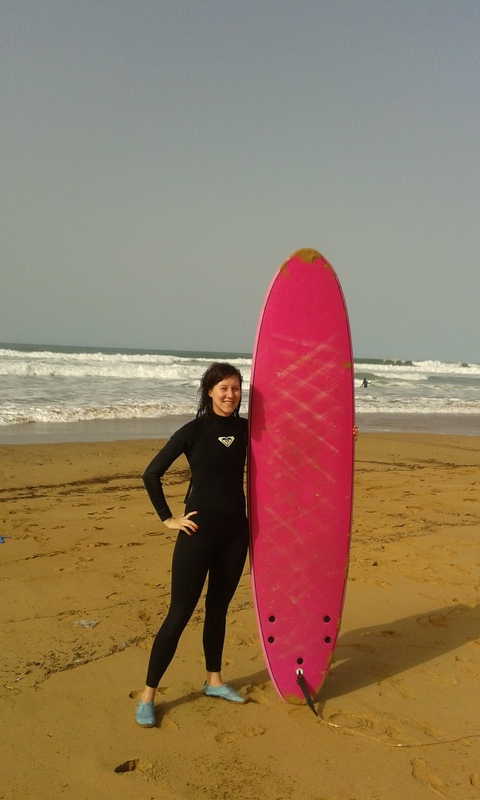 And for that reason I spent Christmas 2014 in Morocco learning how to surf and enjoying the sun and warm weather and singing with my guitar playing friend. Now back in Finland I’m full of energy and excitement looking the snow fall quietly outside. It’s a good way to begin a new year with many interesting plans I’ll let you know later. Welcome the year 2015 with happy feelings! This entry was posted in musician's lifestyle on January 3, 2015 by helipauliina.